If reading about feminine hygiene products grosses you out, feel free to skip this post. I’m writing it because I only found out about reusable menstrual products by accident and really wish I’d known about them sooner. I now use the DivaCup and washable cloth pads. Both of these options are simple, comfortable and highly effective at reducing your impact on the environment. The DivaCup is a reusable replacement for tampons. As you’d expect, it’s shaped like a cup; you insert it and it catches your flow like a tampon. It’s a little tricky learning how to insert it but I got the hang of it pretty quickly. You can leave it in for up to twelve hours, much longer than most tampons. It also holds a lot more blood than a tampon, which is very handy if (like me) you tend to bleed heavily. When you remove the cup, you dump out the blood and wash it out with soap and water. It can be a little messy if the cup is particularly full, but as long as you have access to soap and a sink I haven’t found it to be a big deal. In addition to the DivaCup, I also use washable pads. At the beginning of my period I tend to use both at the same time, but as my flow gets lighter I switch to just pads. I got my pads from Glad Rags but there are many other options out there. If you sew you could probably make your own, too. I love my pads from Glad Rags. They are very simple to use: just fill the pad with one or two liners and snap it onto your underwear. The pads are very comfortable and I haven’t had any issues with them slipping out of place. I have had some minor leakages, but only because I was failing to change the pad as often as I needed to. Just like a disposable pad, reusable pads will leak if you let them get too saturated. The pads are also easy to wash. The directions say to soak them in cold water after use and continually until you are ready to wash them. I don’t have the space for that, though, and have been having good success with just soaking them overnight before throwing them in the washing machine with my regular laundry. Sometimes the stains do not come out completely but I figure they’re just going to get bled on again the next month so it’s not really a big deal. Why Switch to Reusable Menstrual Products? Both the DivaCup and washable pads are cost-effective. There is a noticeable upfront cost for both options, but once you spend the initial money you won’t have to spend any more money on menstrual products for years. I haven’t done the math but I’m sure that you’ll save substantially in the long-run. Disposable tampons and pads are expensive, particularly if you buy the greener options. This post is part of Real Food Wednesday at Kelly the Kitchen Kop. 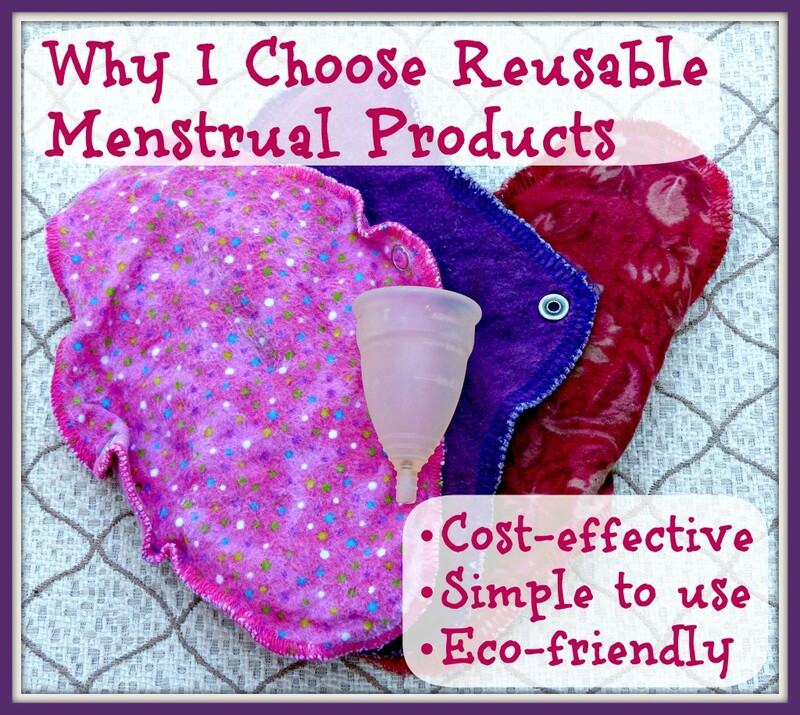 Do you use reusable menstrual products? Why or why not? I’d love to hear your thoughts in the comments. Have you had this issue? When breaking the suction upon removing the diva cup...does it feel like it is going to damage you bc it pulls so hard? I've worried that my cervix could be seriously affected bc of the strong suction. Just wondering if anyone else has experienced this? Hmm. I know what you mean about the suction, but I've never felt like it was too hard. Have you tried squeezing it when you're removing it to help break the seal? Have you looked into possibly using a diaper pail for the pads soaking? I've used cloth diapers and had to soak them until washing... and it would seem to be the same kind of thing. They aren't that big either. The other thing to know (but you probably do already) is hydrogenperoxide gets blood out of anything - no matter how old the blood is. It may take a few 'washes' - but it will work! Which is why you should never use Hydrogenperoxide on a cut or wound of any sort b/c it kills all the good blood cells that are there to do a job. Thanks for this post - I may look into the cup! Don't sign me up for the raffle 'cuz I adalrey have a Diva Cup, but I just wanted to add an encouraging word to those about to try it. It is absolutely THE MOST convenient form of menstrual protection I've ever used. I've used of course pads and tampons, cloth pads, those underwear that have cloth pads built in, and now the Diva Cup for over a year. You don't have to empty it as often as you change a tampon, but if by chance you get caught out in public and need to empty it you just dump it into the toilet and wipe off with tp, so if you're at a friend's house no leaving a tampon in her bathroom trash. At first it felt like it would fall out if I tried to run or otherwise exert myself, but after about a month of Kegels that problem disappeared. It did take a couple of months to get used to, but now it's much more comfortable than a tampon. I have a friend who cut the little "pull tab" off the bottom, you'll know what I mean when you get it. Anyway, I'm not a martyr to the environment, but this is one of those perfectly serendipitious things, better for the environment, easier on my pocketbook, and more convenient and comfortable for me. I've been using menstrual cups for quite some time now and It has indeed save me time, effort and money. I don't regret making the switch. We have the same reasons for the switch! I just made that switch late though. But There's no regret here. I am sure I made the right choice especially that reusable menstrual products, menstrual cups especially, don't just save me, but the environment, too!